Foundations - In 1924 Dr. Rudolf Steiner gave a series of eight lectures on a proposed new organic agricultural method in Europe. These lectures formed the basis of what we now call Biodynamic agriculture. He was invited to speak to a group of estate owners who were concerned about adverse effects on their soils, plants and animals that they believed resulted from the adoption of artificial fertilisers. First Modern Organic Method . Biodynamics was the first new “organic” farming method of the twentieth century. Traditional farming was historically entirely organic, but the use of water soluble fertilisers (at first phosphates, which were introduced from the mid nineteenth century and then later nitrates were also added). By the end of the nineteenth century, use of both phosphates and nitrates had become wide spread thus ending the organic agriculture era. Biodynamics was then the first organic agricultural method of the modern era. The most important preparation is called “500” and is made by putting cow manure into cow horns and burying the horns over winter, resulting in a microbial concentrated material (500) retrieved from the horns in Spring. The cow manure is completely transformed into a humus like material and is then stored in earthenware containers, packed in peat moss and kept moist (to keep the culture of microbes alive). When conditions are right out on the farm, a small amount of 500 is added to warm water and put through a vigorous stirring process which oxygenates the water and results in a massive proliferation of beneficial microbes . When sprayed on moist, warm soil , (500 acts similar to cultures used in yoghurt, and sourdough bread) the microbes multiply out in the soil and is a proven powerful stimulator of soil biology, fostering microbial activity, humus formation (organic matter breaks down quickly and is converted into colloidal humus) and root growth. Why Cow Horns ? Tests comparing manure buried in cow horns with manure buried alongside in earthenware or wooden containers, showed that only the manure in the cow horns converted into highly refined, microbe rich humus called 500. Other Biodynamic Preparations - There are six other Biodynamic preparations, which are made from various herbs and one mineral (quartz crystal). The herb based preparations work on soil biology and fertility, and are commonly used together with 500 (now called ‘Prepared 500’, which has been shown to be even more effective than 500 alone). These preparations can also be used when making compost. They introduce the most beneficial micro-biology to help digest the organic matter in the compost heap. The finely ground quartz preparation (501) is used to overcome the negative influence in plants, of overly wet, humid or cloudy periods. Biodynamic farmers have found that on their farms the soil biology activating preparations have been shown to produce improvement to soils in terms of microbial activity, humus levels, soil structure, deepening colour, water infiltration and water holding capacity. 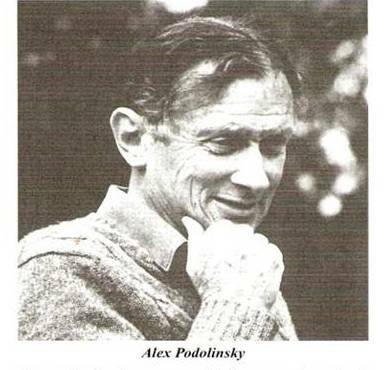 Biodynamic Development in Australia – Alex Podolinsky came to Australia in the early 1950s and began the task of developing the method to suit broad acre farming and the low labour conditions characteristic of Australia. By 1980, over 1 million acres were being farmed Biodynamically, mostly by professional farmers whose families had been on the land for generations. Because the Australian Demeter biodynamic method has been successfully used on farms in Australia this method has been adopted in Europe, and increasingly in Asia. Many developments in Biodynamics have since been adopted by conventional farmers, for example deep ripping to reduce soil compaction, first used by Alex Podolinsky in the 1950s. *For information about this go to the 'Email us' page .